A summit held Thursday called by European Union official Donald Tusk regarding the renegotiation of Brexit. 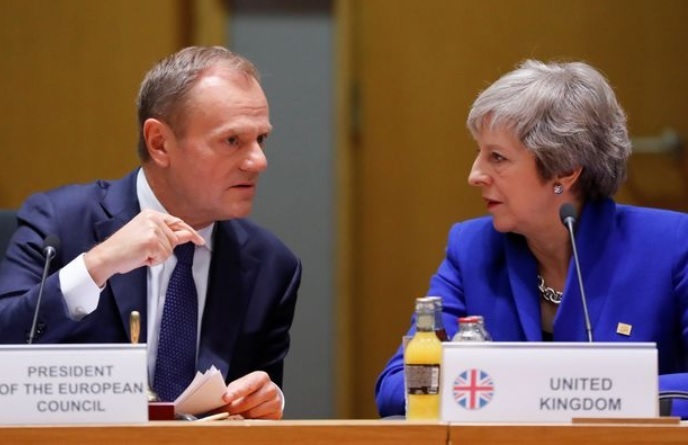 Tusk said he won't renegotiate the Brexit deal with the U.K. government after examining ways to help Britain ratify the deal. Tusk is the president of the European Council and tweeted, "we will not renegotiate the deal, including the backstop, but we are ready to discuss how to facilitate U.K. ratification." The leader added that "time is running out, we will also discuss our preparedness for a no-deal scenario." The European leaders were scheduled to meet in Brussels on Thursday and Friday to discuss key issues such as migration, budgets and other matters as a result of the separation. BREAKING: EU official Donald Tusk says bloc won't renegotiate deal with UK as he calls a Brexit summit for Thursday. British Prime Minister Theresa May’s Brexit strategy has been described as "a game of hide and seek" by a key member of the European parliament's Brexit team. The same member says the tactic will fail to force the EU to renegotiate the withdrawal of the U.K. Green MEP Philippe Lamberts said May's claim to seek additional reassurances to the U.K deal with the EU had already been turned down. "We are fully behind negotiator Michel Barnier but he has been very clear: if you want Brexit, the deal is on the table and there will be no other deal," Lamberts said. The European Parlament also needs to approve the U.K. withdrawal and the legal matters and deals surrounding it. Jeremy Corbyn, the leader of the British opposition has challenged Prime Minister Theresa May's decision to delay a vote on Brexit. The vote is set to take place in the House of Commons but May's stalling tactic is running out of time. Corbyn argued that May's government is in "complete disarray". Lawmakers from the labor party shouted "Resign! Resign!" as May spoke Monday, a move that added further injury to the humiliation of her signature piece of legislation failing, the Brexit separation from the EU. Corbyn called the current state of affairs unprecedented and serious saying "the government has lost control of events and is in complete disarray." Members of May's own party were even turning on her to criticize how she's handled the negotiations. Where are the feminists now who want 50 percent woman on every board and a female president in the U.S.? May has led the situation to even worse waters with her incompetent bungling of the whole deal. Meanwhile, the British pound continues it's sharp descent since May canceled the vote on her Brexit deal. The British currency is considered the main indicator of international investors' overall confidence in the country's economy. The pound fell to a 20-month low of $1.2515, on Wednesday alone is fell 1.7 percent, at that rate it won't be worth anything soon.